Mix a batch of your favourite pizza dough. I recently discovered Fleischmann's super convenient Pizza Crust yeast. Follow the recipe on the package and in a matter of minutes the dough is ready to go, it doesn't need to sit, rest and rise...the dough is ready immediately. If you don't have access to Fleischmann's pizza crust yeast, use the pizza dough recipe we shared before. If all else fails, most grocery stores carry fresh balls of pizza dough in the bakery department. Once you have your dough made, divide it into 4 balls. Work with one ball at a time, being sure to cover the other balls with a tea towel. We like to use durrum semolina flour to flour the work surface, but all purpose flour will work as well. Roll out the ball of dough, into a 1/4 inch thick disk. Now it’s time to add the filling to one side of the disk, making sure to leave 1 inch edge free of filling. For our savoury calzones we made a traditional pizza option. 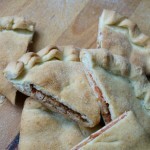 This calzone is filled with 2 tbsp tomato passata, 1/2 tsp dried oregano, 1 slice of prosciutto (cut into small pieces), 1 slice of sopressata (cut into small pieces), 1 tbsp sundried tomatoes (chopped) and 1/2 cup of shredded mozzarella. Change the filling as you like. For next savoury calzone is filled with 1/2 cup of shredded chicken that has been warmed in a small saute pan with 1 tbsp butter chicken paste and 1 tbsp water. Once warmed through, add the cooled filling to the calzone. The sweet calzone is filled with a medley of fruit. Warm through 1 cup of fresh or frozen fruit, 1 tbsp of brown sugar and 1/4 tsp of cinnamon. Add the cooled filling to the calzone. Now for the fun part, closing the calzones. Stretch and fold the side without the filling over top of the filling side. Press the edges together. Fold the edge over and crimp the dough with your fingers. Fold, pinch and press..it’s pretty easy once you get the hang of it. Once the calzones are closed, use a sharp knife to cut a few vents in the top of the calzone. Finally, lightly brush the tops of the savoury calzones with olive oil. Brush the sweet calzone with melted butter and a pinch of sugar. Bake the calzones on parchment paper, which prevents the calzones from sticking to the baking surface. Place the calzones on a pizza stone or on a baking sheet. Pop the calzones into an oven that is preheated to 425°C for 15-20 minutes. Remove the calzones from the oven and enjoy with a favourite dipping sauce – tomato passata, marinara sauce or mango chutney. Add a little ice cream to the sweet fruit calzone. Calzones are super easy to freeze. Make the calzones and before baking them, place them in a single layer on a parchment lined baking sheet. Place in the freezer, once frozen transfer the calzones to a freezer bag and store them until you need them for lunch, dinner or a snack. Bake them from frozen.